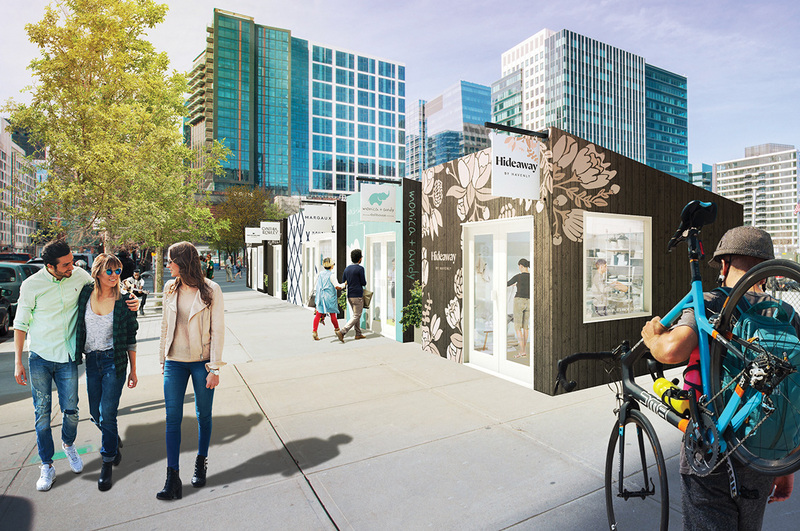 Boston, MA WS Development reveals its latest innovative retail experience, The Current: a pop-up village with a permanent presence and a new micro neighborhood designed to become a focal point in Seaport. A compact neighborhood of modular structures, The Current will play host to a different collection of retailers on a rotating basis, ranging from beloved local startups to first-to-Boston national brands – each connected by a common thread and theme that changes periodically. Nine new businesses opened on July 22nd in this first iteration, She-Village at The Current. Shining a light on the women shaping the future of retail, the first mission-driven incubator hosts a block party of female-founded and fashion-forward brands. She-Village at The Current is centrally located on Seaport Blvd., adjacent to District Hall and Seaport Common, at 85 Northern Ave.
“WS’s pioneering history of creating pop-up retail experiences coupled with the Seaport District’s track record, one that rewrites the retail narrative, is a powerful combination. The Current is the perfect fit for our creative and ever-changing neighborhood. This diverse collection of retailers tells a story of passion, purpose, and empowerment that is bound to inspire other entrepreneurs and that further solidifies Seaport’s role as a retail and innovation hub,” said Todd Norley, senior vice president of leasing, WS Development.